Fear is a generally adaptive state of apprehension that begins rapidly and dissipates quickly once the threat is removed (phasic fear). Anxiety is elicited by less specific and less predictable threats, or by those that are physically or psychologically more distant (sustained fear). In a new report in the Journal of Neuroscience, Davisâ€™ team describes the effects of a brain communication chemical, which is known primarily for its role in driving migraine headaches, in enhancing anxiety. “This is the first study to show a role of this peptide, in a brain area we’ve identified as being important for anxiety. Â This could lead to new drug targets to selectively reduce anxiety,” Davis says. His team found that introducing calcitonin gene-related peptide (CGRP) into ratsâ€™ BNSTs can increase the anxiety they experience from loud noises or light, in that they startle more and avoid well-lit places. This peptide appears to activate other parts of the brain including the amygdala, hypothalamus and brainstem, producing fear-related symptoms. 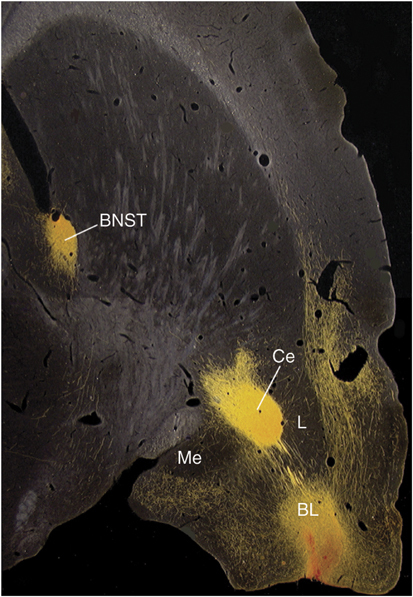 If Davis and his colleagues block CGRPâ€™s function by introducing a short, decoy version of CGRP into the BNST, the reverse does not happen: the rats are not more relaxed. However, the short version does block the startle-enhancing effects of a smelly chemical produced by foxes that scientists use to heighten anxiety-like behavior in rats.Â This suggests that interfering with CGRP can reduce fear-related symptoms in situations where the rats are already under stress. â€œBlockade of CGRP receptors may thus represent a novel therapeutic target for the treatment of stress-induced anxiety and related psychopathologies such as post-traumatic stress disorder,â€ says the paper’s first author, postdoctoral fellow Kelly Sink. In fact, experimental drugs that work against CGRP are already in clinical trials to treat migraine headaches. But first, Sink reports that she and her colleagues are examining the relationship between CGRP and the stress hormone CRF (corticotropin-releasing factor) — another target of pharmacological interest — in the parts of the brain important for fear responses.